Love is in the Hair! Michael Canalé is celebrating Valentine’s Day the month of February! 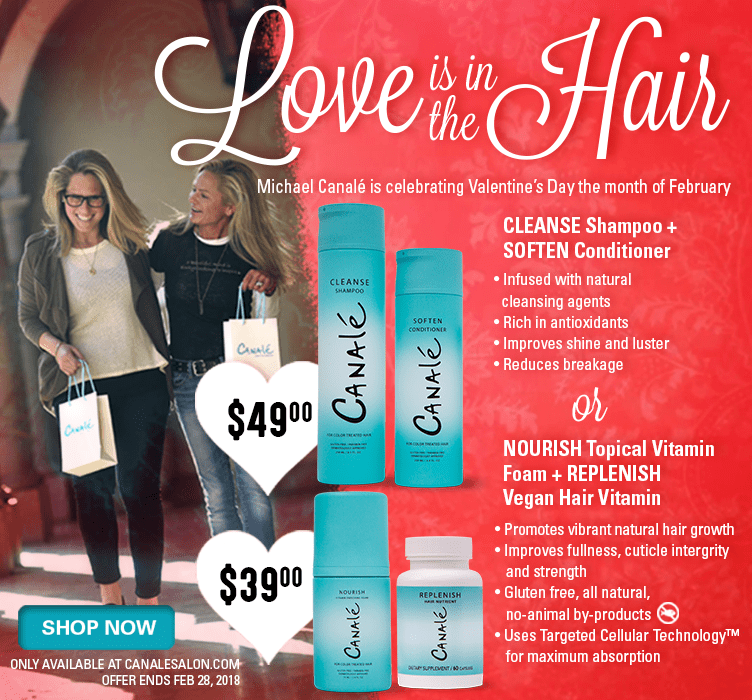 For a limited time, get Canalé CLEANSE Shampoo + SOFTEN Conditioner for only $49.00 and NOURISH Topical Vitamin Foam + REPLENISH Vegan Hair Vitamin for only $39.00! Infused with natural cleansing agents, CLEANSE Shampoo, is formulated to bring out your best color without stripping it of moisture, leaving it bright and clean. SOFTEN Conditioner contains a sensual blend of natural oils and protective antioxidants, formulated to reduce breakage and improve hair shine and luster. Michael Canalé has carefully selected the ingredients in CLEANSE Shampoo and SOFTEN Conditioner to improve overall health of your hair, so it is left soft and shiny, with beautiful, clear color tones. NOURISH Topical Vitamin Foam contains a blend of antioxidants and essential vitamins that promote vibrant, natural hair growth. Made with an exclusive formula, NOURISH improves fullness, cuticle integrity and strength. Your hair will love you when you use REPLENISH Vegan Hair Vitamin. Developed to promote long healthy hair, REPLENISH uses patented Targeted Cellular Technology™ for maximum absorption. REPLENISH is gluten free, all natural with no animal by-products. Created by Master Colorist Michael Canalé himself, Canalé products are one-of-a-kind perfect for you or as a gift for your special someone. Celebrate Valentine’s Day the right way and SHINE ON! Offer ends on February 28, 2018.